Please don't send e-mails asking about channels in the application. Check the most Frequently Asked Questions (FAQ) and see the answer for it. All e-mails with requests for free IPTV channel packages will be ignored and not answered. Zapping Type - Black Screen or Freeze Screen. Freeze screen will hold previous stream picture before changing to the new one. Black Screen will put black background before switching to the new stream. Does not seem to work on TVs. Display Refresh Rate (experimental, only if supported by device) - Default / Auto / Device's frame rates. Auto will switch your Display's refresh rate to match the stream refresh rate (24fps, 30fps, 60fps etc). You can set manual frame rate too. Reload Playlist On Start - change how frequently you want your playlist updated from URL on each app restart: Auto (every time), Manual (from app only), after 3, 6, 12, 24 hours. This will make your app start faster without re-downloading the playlist. The playlist is reloaded every time you Restart / Reload from app's settings. Autostart On Boot - Run the application automatically upon device/TV reboot, so you don't need to launch it manually. Application Update (when update is available) - Update the app version automatically from inside the app. Note: The application is no longer available in Google Play/Amazon apps stores. You can install the application on your Android TV, Fire TV and other devices by downloading the latest APK from Android instructions page. Make sure your device has Android 5.0+ version installed. Phones/tablets are not supported yet. Note! If you experience "Stream Error!" issues after updating the app, try full app reinstall (remove/install again). 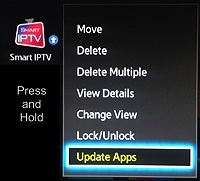 The official Smart IPTV Facebook page has been unpublished due to many page clones available. Please consider all other Smart IPTV pages fake from this moment. Please check the application Support section for Frequently Asked Questions. It will be updated with more FAQs soon. The official application Facebook page will be published again, when there are important updates available. Please downgrade to the previous application version (2.062/2.063), which was published by Samsung, by updating your app from the Apps Store as a usual update. If you have already updated to firmware update version 04.62.12, please update to firmware version 04.62.13 as soon as possible. It will recover the functionality of the application, which was broken during previous firmware update. Added channel sorting function (A-Z, Z-A). If you have audio missing problems on this TV model, please update your TV's firmware to version 1116. My List page was updated today, so please clear browser cache (or close browser window) and refresh the page. If you have problems with the application crashing on unstable streams after the stream goes into "Buffering..." state or throwing "Retrying 1.. Retrying 2.. Retrying 3.." after opening the channel, try updating your TV's firmware to the latest (1470 or newer) available version (Menu -> Support -> Software Update -> Update Now) or use the official update guide. If upgrade is not available online, you can also try upgrading the firmware (through USB) by downloading it for specific TV model from your local Samsung support website or by contacting Samsung support. In TV menu there should be an option to install firmware from USB. Controls: ←/→ (-/+ 30 sec. ), ↑/↓ (-/+ 1 min. ), &Lt;/&Gt; (-/+ 2 min. ), Play, Pause, Stop, Aspect, Back, Exit. RED: change Audio track, GREEN: change play mode, YELLOW: clock, AD./SUBT (Samsung) / BLUE (MAG): change Subtitles language. On the Mylist page, it's now possible to select EPG country priority for your M3U playlist, so EPG for common channel names (Discovery, Nickelodeon etc.) is selected according to your chosen country priority. This is made to detect the language of EPG for your M3U playlist channels more appropriately. You can always check how your M3U playlist will appear inside the application on the converter page. Please make custom changes in TXT file if needed. Please e-mail any irregularities found during conversion (but please analyze them in the converter first), thanks! It's now possible to set the timer for any specific programme. When the specific moment comes, the App will switch to the appropriate channel. You can set the timer by calling the channel schedule (EPG) and pressing the Red button (Set Timer), OK button or by clicking the programme name using Magic Mouse. The timer can only be set for future events. If there is a timer set for some channel, it will be indicated by red dot in channel list. You can now add DVB-T/C/S (digital only) channels on your TV. After setting the option to On (when setting this option, switch to DVB mode on your TV beforehand), new group DVB Channels сwill be added consisting of all of your DVB channels, which you can then add to your Favourites list. When set to Off, these channels will be removed. It's also possible to rescan the updated DVB channels list this way. It's now also possible to check current day's EPG for DVB channels that have not been assigned an external EPG code by pressing Green button or the corresponding Magic Mouse button. On LG TVs with webOS (**LB6** and higher models) the video mode has been changed. Now the app is more responsive, but it needs to be tested against various stream types. So if you notice that something doesn't work after this moment (especially UDP, MMS streams), just change the webOS Video Mode in application settings, it will use the previous video mode. As it's not supported in webOS natively, when you use alternative audio track, the app will select the old video mode to change the audio track. Also in webOS, when you use alternative track for video files, the selected language subtitles will be turned on if the video file contains multiple subtitle tracks. You can now change the EPG Text color in the settings of the Application. Hold the arrow buttons pressed for quicker rotation of available colors, you can also press and hold the P+/P- keys on your general remote control. Click on the arrows for finer selection of colors. It's now possible to select if you want to keep the playlist (or external link) on server or not. Relevant if you have a private playlist with personal access codes. If you don't want your playlist to be kept on App server, just uncheck the Keep online box. Afterwards, when you run the App, your playlist will be saved in TV's internal memory and at the same time deleted from the App server. Later, your playlist will be taken from TV's memory only and if you upload an updated playlist, it will be updated in TV's memory and removed from the server again. If you experience any problems with this new feature, just check the Keep online box again and it will be uploaded to the server as earlier. Or just try another browser if it still doesn't work. You can now add the channels in your list to the "Favourites" group. Inside the "Favourites" group, use the Red button to remove unnecessary channels. Previously selected channels are now shown by pressing "0" (also PRE-CH on Samsung) button or "previous channel" button using Magic Mouse. Use remote control or Magic Mouse to navigate through the list. You can also press "0" repeatedly to select the appropriate channel, it will then be selected automatically after a slight delay, there is no need to press "OK" button. Please report any bugs, thanks! Time adjustment method is changed in the settings of the App. Please use it, if your TV shows current time incorrectly. Please report any bugs. Thanks! You can now check the programme details from the channel list in play mode by selecting the channel and then pressing the red button (duped on Info button). For "non-magic" remote only for now. In the App settings you can now assign the blue button with Picture Aspect Ratio function. Useful in case you have Smart Remote Control without P.SIZE or TOOLS buttons. Added the option to switch channel Groups by using Left/Right buttons, while scrolling inside the Group list is accomplished using Page+/Page- buttons. By default, Groups can be switched using Page+/Page- buttons, while scrolling inside Groups is accomplished by Left/Right buttons.